Phil, this is lovely. I'm not really a chocolate fan, but I would enjoy a tiny slice of this with lashings of crème anglaise and some raspberries. Usually, here anyway, chocolate cakes are ooey-gooey mountains of more frosting (icing) than cake. If I have some potato flour in my freezer, I just might make this as soon as the weather cools off. Much as I love chocolate I really don't enjoy the overly gooey, frosted chocolate cakes these days. This cake is definitely a much lighter option. This gateau sounds good. I don't like gooey over frosted cakes either. I just want to taste the chocolate. Sad to hear that 'We Should Cocoa' is ending. Have posted on there in the past, but don't do any link ups these days. I think I might have chosen a gooey cake over this simpler effort many, many years ago but my tastes have definitely changed. I'd like to think that it's the wisdom of age but I'm sure it's not. Lovely thick cream would be a fine addition to the cake so why not? 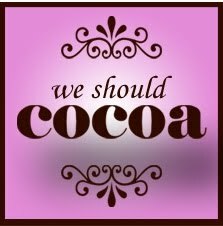 I shall miss the We Should Cocoa linkup but I'm pleased that you found it before it disappeared. I am fascinated by the history of food and the origin of recipes but I wouldn't claim to be correct in most of what I say about it. I've learnt over the years that it's a very confusing subject. This looks like a very indulgent kind of chocolate cake, more dinner party than afternoon tea, rich and slightly naughty. Perfect with a dollop of cream - and as James Martin once said, what's the difference between a dollop and a quenelle - answer - twenty quid. I'm also extremely envious of your cake stand. I'm very sad to see the end of We Should Cocoa, the source of scores of saved recipes and much inspiration. I would have liked to contribute but missed the deadline for the linky. Oh well, it's the thought that counts. For me it's a dinner party cake but I must confess that I'd eat it at any time. It's a little indulgent, but it could be worse. I think the cake stand might have come from a sale in one of 'The Pier' shops shortly before that chain shut their doors for good around ten years ago. I like cake stands but I've nowhere to put any more. This looks so deliciously rich and chocolaty. I'd like to eat this with some double cream! Yum.